When we’re sensitive or intolerant to gluten-free foods and happen to be traveling in a foreign country, it’s definitely not easy to find a place where we can grab a bite without thinking of the risks and still have enough peace of mind to enjoy our meal. And yet, more and more trendy restaurants with interesting concepts are popping up all over Paris. These restaurants, some of which propose gluten-free dishes, are adapting their menus to all the various intolerances that exist today. Even your most skeptical friends will end up joining you for a meal! Every gluten-intolerant person probably dreams of being able to walk in to a restaurant and order what he or she feels like without having to break down all the ingredients in a dish or ask loads of questions that cause a bit of embarrassment. And, of course, being able to savor a delicious meal without it being a last resort because it happens to made from substitute ingredients. For these reasons and more, NoGlu is a restaurant that proposes a creative, ever-changing menu. An attentive staff serves up carefully prepared dishes that are contamination risk-free. It’s here at NoGlu that you can truly enjoy your dinner with friends or business lunch, worry-free. Here’s a sneak-peek at what NoGlu has to offer: meat, feat and vegetable dishes all days of the week, pizza on Tuesdays, burgers on Wednesdays and brunch on Saturdays. Gluten-intolerant folks, your time for revenge has arrived! Don’t hesitate to invite your friends to this trendy restaurant where a chickpea-flour club sandwich will win them over. We bet that they’ll even head to the in-house bakery to get some gluten-free bread and cheesecake! Reservations: 01 40 26 41 24. Lunch, Mon.-Fri., noon to 2:30 p.m., brunch Sat., 11-3 p.m., dinner Tues.-Sat., 7:30-10 p.m. Although it’s not a bonafide, certified gluten-free restaurant, Café Pinson is nonetheless a successful café that proposes wheat-free dishes, no milk products, organic and vegan food, all in a healthy and innovative menu. Created and tastefully designed by Dorothée Meilichzon, a naturopathy nut, Café Pinson is proof that well-being, sociability and a passion for food can be successfully combined. It’s truly an experience to be had, whether for lunch, dinner, or Sunday brunch. Go on, give their mixed salads, vegetable curry, crumbles and vitamin-packed veloutés a go. On the sweet side of things, don’t forget about tea, smoothies, madeleines and latte! Due to this health-conscious café’s overwhelming success, Café Pinson isn’t going anywhere anytime soon, and it’s certainly not finished inspiring new adepts in Paris: 3 addresses are tailored to amateur foodies who want home-cooked meals and foodies with a variety of intolerances who are craving real savors. 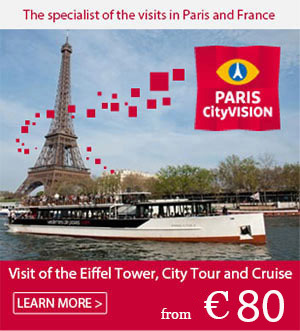 Paris 3e: 6 rue du forez, +33 (0)9 83 82 53 53 Mon.-Fri.: 9-midnight / Sat. : 10-midnight / Sun. : noon-6 p.m. (BRUNCH 2 services: noon and 2:30 p.m.) Paris 10e : 58 rue du faubourg poissonnière, +33 (0)1 45 23 59 42 Mon.-Fri.: 9-7 p.m. / Sat. : 10-7 p.m. / Sun. : 11-6 p.m. (BRUNCH 2 services: noon and 2:30 p.m.) Paris 8e @ LE 66 66 Avenue des Champs-Elysées, Mon.-Sat. : 11:30-6 p.m. / Sun. : 1:30 p.m.-6 p.m. 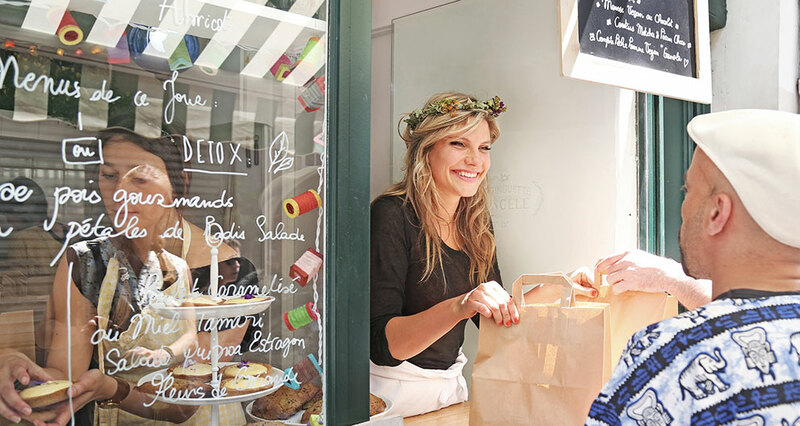 Initially a detox caterer who proposed healthy buffets scarfed up during the lunch rush hour, the Guinguette d’Angèle fast became one of the capital’s alimentary heartthrobs. Yes, it’s true: organic food, gluten-free food and even vegan food can be glamorous, eaten while wearing Chanel, and sufficiently trendy for Kitsuné. It goes without saying that everyone wanted to get their hands on bite-sized munchies made from prairie flowers, kale burgers and striped tomatoes. So when Angèle finally opened her café in Paris, proposing healthy lunch boxes with quinoa and celery soup, hoards of foodies flocked to her doors. Now that the brouhaha has passed, the café still has its faithful followers who haven’t abandoned their healthy lunch ritual. Constantly reinvented, the menu keeps new arrivals coming in. Picnic boxes allow for easy take-out and yummy meals: risotto, gluten-free falafels, matcha latte, you name it. 34 rue Coquillère, 75001 Paris. Mon.-Fri.: 11:45-3 p.m.